Mark another significant first for the gopher frog restoration effort in southwest Georgia. Last week, senior wildlife biologist John Jensen with Georgia DNR’s Nongame Conservation Section found a gopher frog egg mass (above) at Williams Bluffs Preserve in Early County. More confirmation: Lora Smith, associate scientist at Joseph W. Jones Ecological Research Center, recently reported recordings of gopher frog mating calls at Williams Bluffs. 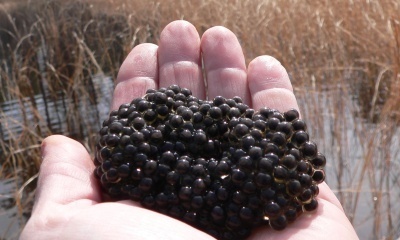 The egg mass photos sparked cheers from the Jones Center and other the organizations that since 2007 have poured time and gopher frogs – more than 4,000 – into the effort at The Nature Conservancy preserve near Blakely. 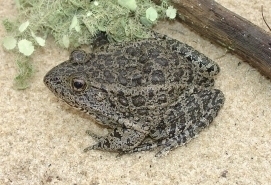 The loss of intact upland sandhill habitats and fishless wetlands needed for breeding has reduced Georgia’s gopher frog populations to about 15. The frogs named for their use of gopher tortoise burrows are state-listed as rare and petitioned for federal listing. The first eggs are a big first step. Other promising signs include introduced frogs surviving to adulthood (“Discovery raises hope,” Nov. 15) and the survival of frogs released directly into tortoise burrows. Drought dried the wetland the past two years, leaving frogs no place to breed. This winter, rains filled it. The rest is gopher frog history. Next steps include continued monitoring at Williams Bluffs, plus consideration of other possible restoration sites, such as Ohoopee Dunes Wildlife Management Area near Swainsboro. Project partners include Atlanta Botanical Garden, DNR’s Nongame Conservation Section, the Joseph Jones Ecological Research Center, The Nature Conservancy, UGA and Zoo Atlanta. Bear Hollow Zoo in Athens has also helped. One of the top 10 longest-running festivals in Georgia – and no doubt the wildest – returns March 9-10. The 46th annual Claxton Rattlesnake & Wildlife Festival will feature scores of rattlers and other snakes, plus plenty of wildlife-related exhibits and shows, along with more than 170 food and craft vendors. The former rattlesnake roundup organized by the Evans County Wildlife Club drew a record crowd of about 18,000 last year, as news spread that the event would no longer buy and sell rattlesnakes (“Fest drops wild-caught rattlers,” January 2012). Organizations such as DNR, Georgia Southern University’s Center for Wildlife Education and Zoo Atlanta will again support the event. 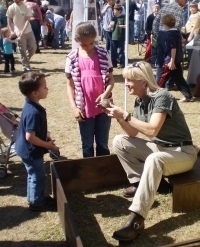 DNR staff will hold wildlife programs at elementary schools in Metter and Lyons Friday. The club’s former president said the event combination of more wildlife and educational outreach “hit a home run” last year. It is the Year of the Snake! As part of a same-themed effort by Partners in Amphibian & Reptile Conservation, check out DNR’s Snake of the Week feature on Facebook. For more years than I care to remember, I have tried in vain to entice purple martins to nest in my yard. 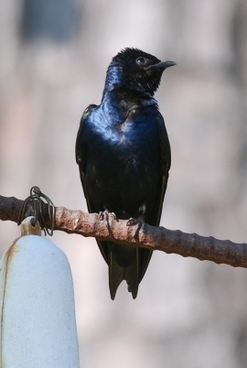 Each year during late winter or early spring, a handful of purple martins magically appear at my martin house. Each year, my hopes run high that this will be the year I become a purple martin landlord. And each year, my expectations are dashed when the birds disappear in a few days, never to return. These first martins are called scouts, a name attributed to the popular belief that the birds are "scouting" for suitable places to nest. They then supposedly fly back to their wintering grounds in the Amazon Basin and lead the rest of the martins back. As much as we might like to believe this, such is not the case. Still, these early arrivals -- and the hopes they raise, and dash -- are the vanguard of a timely and fascinating migration. Read more in Terry’s complete column! Got binoculars? You’ll want a pair April 12-14 as Sea Island gear up for a bird-focused weekend adventure. The getaway at Sea Island, a premiere site for birds, will feature birding experts and experiences and a photography skills workshop, all benefiting novice and veteran birders. The guest speaker is former DNR Nongame Program Manager Brad Winn, now a conservation specialist at Manomet Center for Conservation Sciences in Massachusetts. Winn will give an overview of coastal birds and discuss in detail the migration of whimbrels. Learn more about the birding weekend and the lineup of optional nature-related activities online, or by calling (855) 228-5632 for reservations. 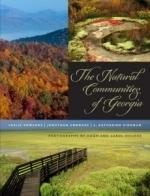 New from UGA Press, “Natural Communities of Georgia” provides an essential reference for ecologists and a rich resource for all interested in the state’s natural heritage. The 700-page guide, authored in part by Nongame Assistant Chief Jon Ambrose, details Georgia’s 66 distinctive natural communities with an eye on conserving this ecological diversity. A foiled attempt to steal sea turtle eggs has a Brunswick man facing up to five years in prison and a $250,000 fine. In May, DNR rangers with a K-9 caught Lewis Jackson Sr., 58, leaving Sapelo Island with 156 loggerhead eggs in a cooler. Jackson, who pleaded guilty in federal court, has not been sentenced. DNR fisheries biologists Jimmy Evans and Don Harrison have been honored by the Georgia chapter of the American Fisheries Society. Evans received a Career Contributions Award largely for his work in conserving the robust redhorse. Harrison was named Fishery Worker of the Year in part for his leadership in a federal process that resulted in a permit providing for a commercial shad fishery and protecting endangered sturgeon -- the only such permit on the Atlantic coast. Kids and teachers, take part in the 2013 Give Wildlife a Chance Poster Contest! Deadline for entries into this popular conservation-oriented competition for grades K-5 is March 27. A federal jury said a Jacksonville, Fla., man lied when he told wildlife officers he was bitten by a black mamba during an alleged sale gone awry near a Kingsland Wendy’s in 2011. DNR rangers later videoed John Kenneth Rosenbaum, 24, confessing that he had actually been bitten at home by his pet Egyptian banded cobra. ’Seen these photos of a fin whale – the third straight year one has been seen in the Southeast in winter – or this shot of a North Atlantic right whale just off Jekyll Island? Find more on the Wildlife Resources Division’s Flickr site. Gov. Nathan Deal recognized Georgia Power, Plum Creek and Wells Timberland as 2012 partners in DNR’s Forestry for Wildlife Partnership on Feb. 7. As part of the voluntary program targeting corporate forest landowners, the companies have helped improve 974,015 acres for wildlife. Georgia landowners in key areas can apply by March 15 for federal aid to help sustain gopher tortoises and golden-winged warblers. The Working Lands for Wildlife Initiative is a partnership with farmers, ranchers and forest landowners to restore and protect habitats for at-risk species. Killing an endangered whooping crane will cost a South Dakota man $85,000 in restitution and ban him from hunting, fishing or trapping in the U.S. for two years. Jeff Blachford, 26, pleaded guilty to shooting the crane, one of the world's rarest birds, last April. "Three charged with bear poaching; more arrests expected," The Atlanta Journal and Constitution. Follow-up: "Bear-hunt probe arrests 90 in Georgia, N.C."
wildlife not legally fished for or hunted, plus native plants and natural habitats.